This is a painting of a beautiful Hungarian Vizsla that I finished a few days ago, pre-flu, that is. I might also mention here that in five more weekends, the Portland Saturday Market opens up again, so I'll be spending my weekends down there. I'm so looking forward to getting back to it; I love meeting the people who like my artwork and just the general pleasant atmosphere of the place. It's a great place to be on a weekend -- even when it's raining! On those days, I just hunker down in my booth, drink lots of hot coffee and cocoa, and am especially happy to see those people who don't think they'll melt in our wimpy rain. By the way, lots and lots of people from outside the Pacific Northwest even tell me that they like the rain. Something for everyone here, I guess. If you live in Portland, OR, (or are visiting here sometime), drop by and say hi. If you've never visited Portland before, don't miss it; it's a wonderful, beautiful city, with lots of interesting things to see and do -- including, of course, Portland Saturday Market! This is a commissioned painting I finished recently for a birthday recipient. With permission from the client, I have added photos of him as he received his painting. They are below. A note to Carol: I'm sorry I've been so slow getting your painting listed on my blog. My family and I have all been suffering from the flu over the past week or so -- I can't even remember how long because it seems someone has been sick forever here. I was the last to catch it, and I think I am about finished with it now. Listen up, Everyone! I am a silly person when it comes to shots -- I am terrified of them! Don't put off getting your flu shots, fear of needles or not! Flu is not a pleasant way to spend a week; a shot only hurts for seconds. Don't put it off; I promise you the flu is much, much worse than the shot. 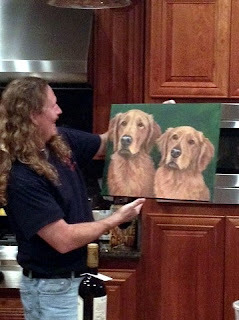 Here's the birthday boy admiring the painting of his two favorite sweeties, Indy and Sadie. Another shot of the birthday festivities and "the gift." This is a yellow lab painting I finished today. The color is a bit off in this photo, but I'll put up a corrected one tomorrow with better lighting. 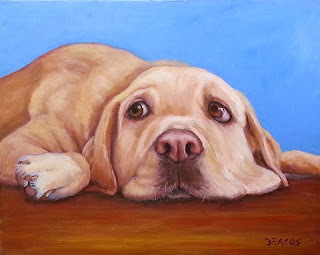 The painting is a 16x20x3/4" acrylic painting on a stretched canvas. Both the original and prints are available. Contact me if you're interested in the original, and you can buy prints on Etsy. I'm still busy painting custom paintings, but I have about a week now before I need to start on February's orders, so I'll have a bit of time to do some paintings that I've been wanting to get painted. 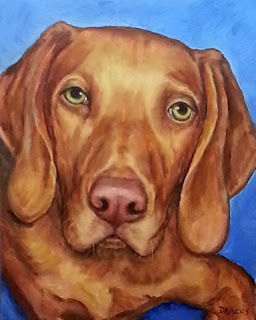 This beautiful dog was one of them, and I'm hoping to get a few farm animals done (well, maybe one or two at most). Still loving my little studio. I spent a couple of days last week completely insulating it. It was hard work, but it's oh-so-cozy now that I can spend hours at a time in there. I just finished this little sweetie this afternoon. It was a pleasure to paint. Sorry, I didn't take progress photos of this one. 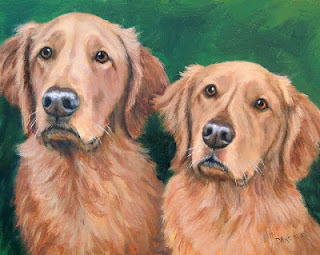 That has turned out to be a little more difficult than I thought it would be, so I won't be doing it on every painting. First, I lose my momentum if I stop every 15, 20, or 30 minutes to take a photograph. Then somehow, I get the order of the photos all messed up while I'm trying to organize them. Then I never, ever seem to have time enough to post what I've just done all that work recording. I'll try to do it from time to time, but for me at this time, painting is much more important. 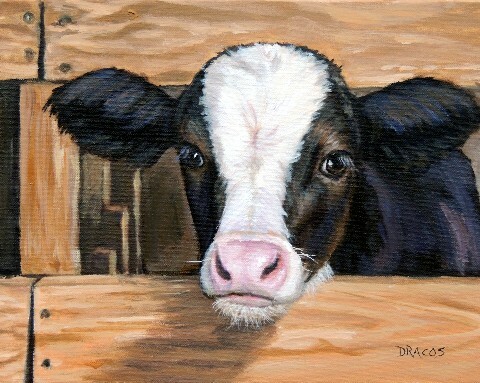 I have many images that I intend to paint, and I never seem to have enough time to do them as quickly as I would like. I don't know how more successful people do it! Oh, I know: They have someone who prepares their canvases for them, does all their computer and paperwork, washes their brushes at the end of the day, etc., etc. That last one is what gets me the most: washing brushes. I learned the hard way how important it is, though: Acrylic paints are like some kind of really great glue. And if every single molecule is not scrubbed out of every single brush, the brush is ruined -- or becomes so very quickly, anyway. So it takes me at least 15 or 20 minutes every evening to wash my brushes. And I paint pretty much seven days a week now, so that's a lot of time spent washing brushes! But they cost so much, and I have favorites that I just couldn't live without, so I have to do it. I finally got to finish the custom painting for which I had earlier shown all the progress photos. As you can see, I made only a few small changes, such as I removed the collar, tightened up some things here and there, added more highlights and a few more shadows, and just neatened up and tied together the whole painting a bit better. 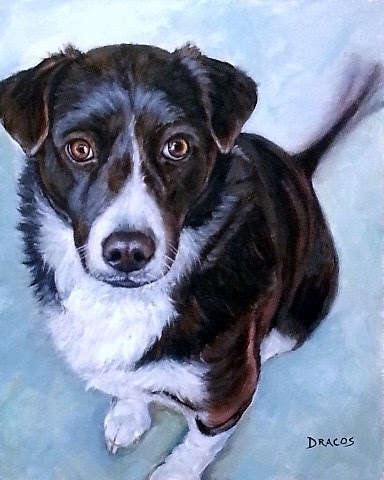 So this is Jack, who is, I think, a border collie mix, who is very, very beloved, I believe. 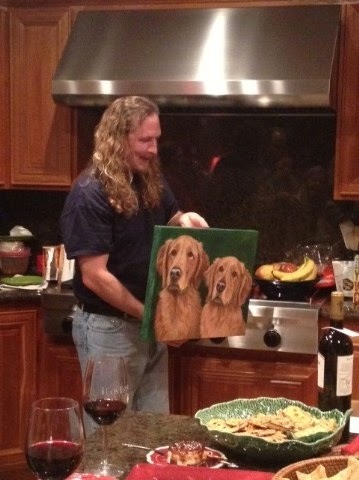 This is one of my some of my favorite paintings in a while. 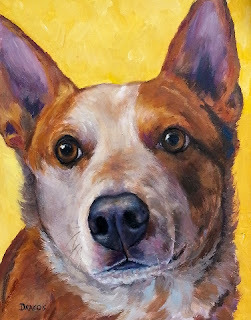 Not only is the dog a beautiful one (he was a custom painting I did during December -- one of the many reasons I've not been posting regularly, by the way), but I feel I did a pretty good job at rendering his image. I feel that it has a lot of three-dimensionality to it, and that's what I strive for. Sometimes I get it; sometimes I don't. I don't want to "jinx" my work, but I am moving into a period where I have a little more confidence in what I'm doing. It feels to good be able to go into my studio because I'm looking forward to a good day there rather than endlessly procrastinating to get started because I'm so afraid I can't "pull it off" again.